© Bloomberg. 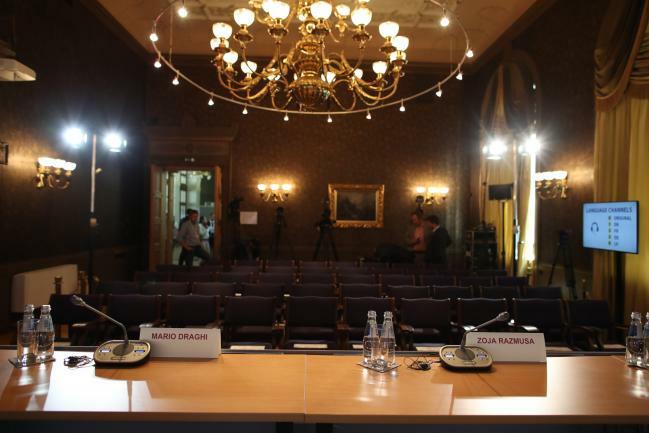 Name plates for Mario Draghi, president of the European Central Bank (ECB), and Zoja Razmusa, deputy governor of the Bank of Latvia, sit on a desk ahead of the ECB rate decision in Riga, Latvia, on Thursday, June 14, 2018. (Bloomberg) — Mario Draghi said the euro-area economy is strong enough to overcome increased risk, justifying the European Central Bank’s decision to halt bond purchases and end an extraordinary chapter in the decade-long struggle with financial crises and recession. The announcement came only hours after the Federal Reserve raised U.S. interest rates for the second time this year, highlighting how a decade of easy money in Europe and America is gradually coming to an end. Still, the People’s Bank of China opted not to follow the Fed in raising borrowing costs, and the Bank of Japan is expected to maintain its stimulus when it meets on Friday. The euro fell on the outlook for interest rates, trading 1 percent lower at $1.1675 at 3:04 p.m. Frankfurt time. Economists before the decision had predicted borrowing costs would rise around the middle of next year. The ECB decision came with caveats though. Draghi said ending asset purchases would be “subject to incoming data,” and that rates are expected to stay at record lows for “as long as necessary” to keep inflation on a sustained path toward the goal of price growth just under 2 percent over the medium term. He also said the Governing Gouncil “stands ready” to adjust its policy instruments if needed. Draghi said the current risks “warrant monitoring” but reiterated the view that the softening is partly due to temporary factors such as bad weather and the timing of holidays, and that it also signifies a pullback from the decade-high growth in 2017. He unveiled updated economic forecasts showing economic growth should slow to 2.1 percent this year, compared with its previous forecast of 2.4 percent. The estimates for 2019 and 2020 were kept unchanged at 1.9 percent and 1.7 percent. Inflation is seen at 1.7 percent this year, up from the earlier prediction of 1.4 percent on the back of higher oil prices, and maintaining that pace in 2019 and 2020.